It's been awhile since my last update. Hopefully this post finds you all doing well in the states or wherever you are. I have just moved into my 5th week of school here and am learning a LOT and really enjoying the experience. This past weekend, a friend and I went to Mexico D.F. (otherwise known as Mexico Distrito Federal or Mexico City). We left right after classes to grab some street food and head off to the bus station. Five and a half hours later, we were there, found a place to stay, and crashed for the night. We slept for 5 hours and left for the bus station again to get to Teotihuacan, which is about an hour northeast by bus from Mexico D.F. Here's a little background: The area was supposedly created in the late Pre-Classic period and was split into quadrants. The main road, Calle de Los Muertos (Avenue of the Dead), is the axis of the city. The city covers about 20 square kilometers and includes one of the largest pyramids in the world, The Piramide del Sol which was built in the Pre-Classic period, and the Pyramide de la Luna from the Classic period. The city was abandoned by the Teotihuacanans and it is speculated that the city had grown so large that it could not support its inhabitants with the food needed. The Aztecs later found it, and believing that it could only be built by Gods, gave it the name "Teotihuacan"~ Where Men Become Gods." This site is huge and could take a whole day if you wanted to climb every pyramid. So my friend Marian and I decided to climb Piramide del Sol and hang out in the area. 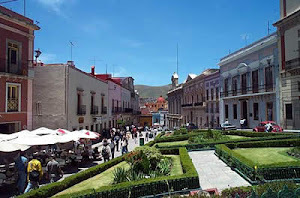 Here is a little blurb about Calle de Los Muertos~ "This ceremonial center was built along a four-kilometer stretch now called Calle de los Muertos, so named because the Aztecs believed ancient kings had been buried alongside it. The northern limit of the street is the Piramide de la Luna, while th southern boundary remains unexplored. The main structure, the Piramide del Sol, lies to the east, aligned with the point on the horizon where the sun sets at the summer solistice. An east-west throughfare is believed to have bisected the calle at some point at the front of the Ciudadela. Along the sides of the calle are the Patio con Pisos de Mica, the Grupo Viking Complex, and the West Plaza and East Plaza Complexes. Farther north is the Puma Mural. Prepping to climb Piramide del Sol. At the top of the Piramide del Sol! You can see the Piramide de la Luna in this photo! Museo de Sitio--includes a labyrinth, artifacts and graves from the stages of Teotihuacan. A neat pillar from the museo. I had always wanted to see the pyramids in Mexico and now I have! It was such a neat experience and I can't wait to explore more when I travel towards Oaxaca after next week. We spent Sunday exploring Mexico City, including the Museo Frida Kahlo, Catedral Metropolitana, Zócalo, and Museo Nacional de Antropología. I didn't know anything about Frida Kahlo before visiting this museum dedicated to her. It was her former house that she had with Diego Riviera which was full of color. The poor woman had suffered physical shocks and was conformed to a wheelchair for most of her life. Her art was really bizarre in my opinion, but with reason. We also climbed the tower of Catedral Metropolitana and got to experience a bell ringing! The view of the city from the top of the cathedral was really neat and I will definitely post photos as soon as I am able. Other than that, Marian and I hung out at the anthropology museum which was HUGE! If any of you have been to the MOMA in New York, you know that a museum like that takes days to see. The anthropology museum was so neat because it included artifacts from all regions of the country and dedicated sections to minority groups. In a nutshell, this trip included a LOT of walking until my feet and legs ached but it was all worth it! I'll be posting photos soon.